Special US envoy to the Middle East George Mitchell met with Prime Minister Benjamin Netanyahu once again Sunday morning, but there were no reports of a possible breakthrough that could lead to the resumption of Israeli-Palestinian peace negotiations. Following the three-hour meeting in Jerusalem, Netanyahu told his cabinet that Mitchell mentioned "a number of ideas on how to jumpstart the peace process, and I expressed hope that these ideas will in fact lead to negotiations - if the Palestinians express a similar interest in them, for the sake of all those who seek reconciliation in our region." Mitchell is scheduled to visit Jordan and Egypt this week as part of his efforts to garner broad support for the peace process in the Arab world. 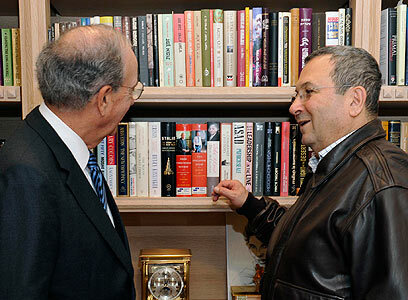 The US envoy met Ehud Barak at the defense minister's Tel Aviv home Saturday night. A Barak aide said following the meeting, "A deadlock (in the negotiations) will lead to another round of violence that will serve Hamas." The Palestinians, for their part, are continuing to insist that a complete halt to settlement construction precede the resumption of peace talks. Chief Palestinian negotiator Saeb Erekat said Friday that Israel is insisting on maintaining control over the Jordan Valley – which makes up 28% of the West Bank. He also said Israel was refusing to negotiate on the future of Jerusalem, claiming it was one of the conditions for Palestinian recognition of Israel as a Jewish state. Erekat said Jerusalem's demand that any future Palestinian state would be demilitarized was also hindering the peace process. "All of these things have derailed President (Barack) Obama's peace train," the Palestinian official said. Sunday's weekly government meeting was also expected to address International Holocaust Remembrance Day. Prior to the meeting, PM Netanyahu noted, "I hope that at the UN they will remember how it was when the Jews had no state of their own, as well as the international community's obligation to defend the existence of the Jewish state." The prime minister, who is scheduled to visit the Auschwitz death camp this week, said, "The fight against anti-Semitism is more important than ever before because the phenomenon has been on the rise. Since Operation Cast Lead , there has been an attempt to use Israel's right to defend itself as a pretext for rising anti-Semitism. Today we will decide on a special taskforce to combat the phenomenon." Later in the day, Netanyahu is expected to take part in a tree-planting ceremony in Gush Etzion, Maaleh Adumim and Ariel ahead of the Tu B'Shvat holiday. He said tree-planting in the West Bank is "aimed at ensuring that we will remain there for many years to come." See all talkbacks "PM: I hope Palestinians will be interested in Mitchell's ideas"